Relieve the people of Dawnstar from Vaermina's curse. Learn of the nightmares of the people of Dawnstar. Follow Erandur to the Nightcaller Temple. Fight your way with Erandur to the library, and then find the book The Dreamstride. Locate and drink Vaermina's Torpor in the laboratory. In the Dreamstride, find and activate the chain that will release the Miasma. Take the soul gem to stop the force field. Make your way to the sanctum and kill Veren Duleri and Thorek. Choose whether or not to kill Erandur. Upon entering Dawnstar you hear talk of the inhabitants suffering from terrible nightmares and lack of sleep. Even the Jarl himself is having trouble sleeping, and tension is high. Make your way to the Windpeak Inn, where you will find Erandur, a priest of Mara. He warns that the inhabitants of Dawnstar are in terrible danger, as the nightmares are a symptom of having their memories stolen by the Daedric Prince Vaermina. He explains that the nightmares are being caused by an event that happened in Nightcaller Temple, a ruin located on the clifftop overlooking Dawnstar. Erandur will prompt you to follow him to Nightcaller Temple to put an end to the nightmares. Make your way with Erandur to the Temple, and speak to him once more outside the door. He will explain why the nightmares are occurring: Many years ago, a group of Orcish invaders attacked the temple, which had been a shrine to Mara before being overrun with Vaermina's priests. To defend themselves, the priests released a gas called "The Miasma", which the priests used to elongate their lives. The concentration of Miasma sent both the Orc invaders and the priests into a sleep that lasted for years. After speaking to him, head inside the Temple. If you have a follower, the follower will not enter. There is a working shrine of Mara on the left side wall inside the ruined temple. On the bottom shelf of the podium in the middle of the first room there is a book Lost Legends which activates the quest Forbidden Legend. Two skeevers inhabit the hall near the back, and a lectern on the raised area contains books. A novice-level chest is on the right side of the large carving on the back wall. 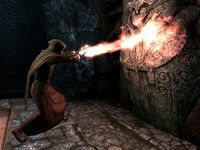 Once the room is cleared, Erandur will unlock the carving with a spell, after which the wall will turn purple and reveal a doorway. Make your way through the opening and follow Erandur to the balcony overlooking the tower's inner sanctum. The inner sanctum contains the Skull of Corruption, one of Vaermina's artifacts. Erandur explains that the Skull has gained the ability to reach out to people without being wielded, and is stealing memories. The Skull must be destroyed in order for the nightmares to stop. Follow him down the stairs, where you will meet two Orcish Invaders at the bottom. After confronting them, you will find the way ahead blocked by a force field. Erandur will say that there may be a way of opening it, but he would have to search for the answer in an alchemy book located in the locked Library upstairs. Luckily, he has a key—a leftover from when he was himself a Priest of Vaermina. When the Orcs attacked, he had fled, leaving his companions to die, and in his shame over this, he turned to following Mara. Follow Erandur back up the stairs and allow him to unlock the door to the library. The inhabitants—Orcish invaders and Vaermina Devotees—will awaken and attack. 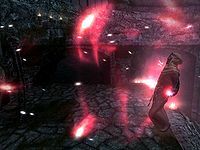 The Vaermina Devotees fight with lightning as well as conventional weapons, so a Resist Shock potion and other defenses against magic may be useful here. The library is split into two levels. The bookcases on the lower level make it quite a tight squeeze but provide useful cover from incoming spells. After all the enemies are defeated, Erandur will ask you to help find the book, The Dreamstride. This contains the information needed to breach the inner sanctum. The majority of the books in the library are burnt, but a few remain intact. The Dreamstride is located on the upper level in the north-east corner of the room, on a lectern. Take it back to Erandur, who will decipher the book and state that you must use a potion called "Vaermina's Torpor." This allows the taker to use dreams to travel across distances in the real world. As a Priest of Mara, he is unable to use the potion, but says that you will be able to do so. Only the unaffiliated or the followers of Vaermina can use it. To find the potion, go to the laboratory, which adjoins the library. Follow Erandur to the laboratory, where you will encounter another Orcish Invader and a Vaermina Devotee. Continue down the corridor, and fight off more Vaermina Devotees and Orcish invaders. You may find it easier to back through the doorway and tackle the enemies one at a time; Erandur is quite capable of dealing with them. After they are defeated, you can look for the torpor—a tall red bottle located on the lower level in a bookcase near the northeast corner of the room. Numerous other alchemical ingredients and potions line the shelves, and on the top level near to where Erandur is waiting, there is a copy of the Alchemy skill book Mannimarco, King of Worms, on a half-buried bookshelf. Speak to Erandur, and he will command you to drink the potion. It's a good idea to save your game here. Upon taking the potion, you are transported to the inner sanctum in the tower, which you experience in a blurry, psychedelic vision. Two of Vaermina's Devotees are talking. Though everything is quite hazy, you can discern from what they are saying that you have traveled back in time to the moment of the Orc invasion of the temple. One of the men addresses you as "Brother Casimir", and asks if you are ready to release the Miasma. There is a clattering noise in the background. You cannot access your inventory or map while in the Dreamwalk, nor can you pick up items or fight; you will not get attacked, however. Reply that you are ready, then head down the corridor and into the dining hall. You will see battles and corpses along the way. Make a left into a bedchamber. Head up the stairs and then down the passage on the right. Navigate a winding path onward until you reach the upper level overlooking the sanctum. Locate a chain with a large ring-shaped pull and activate it. This will release the Miasma. You will then awaken. When your objective updates to "Disable the Magical Barrier", take the soul gem from just to the left of the pull chain. The forcefield will deactivate. Talk to Erandur, and he will report that you disappeared and reappeared on the other side of the barrier, and that you can now access the Skull of Corruption. Follow Erandur toward the Skull, taking care of several Orcs and Vaermina Devotees you will encounter along the way. You may confront some challenging battles here. Hanging back behind Erandur and some strategic retreats can be an effective tactic, but you will likely face the powerful battleaxes of some of the Orcs on a few occasions, or the Devotees's shock spells, both of which can deal heavy damage. Erandur will pause if he begins to get very far ahead of you. When you are nearing the Skull shrine, there is an Orc lying in a room who is especially deadly. He won't wake up spontaneously, but if you try to search him, he will come to and say "This better be good." He's very hard to kill and can bring you down with a single strike, according to the skill level you play at. You can awaken him even after completing the quest. "He's deceiving you. When the ritual's complete, the Skull will be free and then Erandur will turn on you. Quickly! Kill him now. Kill him and claim the Skull for your own! Vaermina commands you!" At this point, you can kill Erandur and take the skull, or spare him and take him on as a follower. Killing him is not considered a crime. 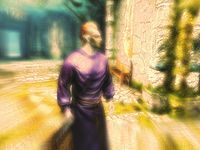 If you ignore Vaermina's command, Erandur will destroy the skull and then offer to travel with you as a follower; he does not betray you as Vaermina would have had you believe. If you choose this option, you will be one Daedric Artifact short of the 15 you need for the Oblivion Walker Achievement. 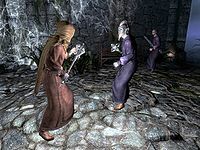 Obtaining two Artifacts from one quest will then be required, and the only way you can do that is by obtaining both the Ring of Hircine and the Savior's Hide from the Daedric quest Ill Met By Moonlight. After making your choice, the quest will complete. Whichever option you choose, the nightmares will be lifted from Dawnstar. If you are over-encumbered when you drink the Torpor, you will be over-encumbered for the entire flashback scene, and will be unable to access your inventory to drop items. If, when exiting the Dreamstride, you don't disable the barrier and instead continue on to the skull yourself, Erandur will eventually teleport to the skull room, after a long walk through the dungeon in the opposite direction. Unless Skald has been replaced as Jarl of the Pale, this quest is one of two required to become Thane of the Pale. Saving (manually or automatically) during or after the Dreamstride portion of the quest will cause the game to freeze on consoles or crash to desktop on PC. To prevent this, avoid saving during this quest, and disable autosaves as well. 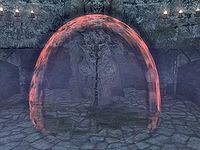 Alternatively, after removing the barrier to speak with Erandur, if you head outside and save your game, you should be able to re-enter the Temple and save normally. This bug may be related to conflicting follower protocols. Leaving the Temple and dismissing any followers you have, or recruiting and dismissing different followers, may fix this. As the bug originates during the Dreamstride, use the console command tcl, cross through the barrier, and remove the soul gem. Since the quest progress is scripted through the status of the soul gem, this will progress the quest just as if you had used the Dreamstride. The only impact it will cause on the game is that there will be no enemies except two Orcs in the dining room, Thorek and Veren. To remove Vaermina's Torpor, use the command player.removeitem 5f6df 1. If you keep the Torpor and drink it later outside of Nightcaller Temple, a message will appear informing you that it only works inside that location, and the potion will be replaced in your inventory. After the quest is finished the Torpor can be dropped or placed in a container. The enemies can be made to appear using two more console commands: Prid C4DB9 followed by enable. Similar to the fix above, using the Become Ethereal shout may allow you to cross the barrier and grab the soul gem, skipping the Dreamstride sequence altogether. The least complicated method to avoid this bug is to exit the Temple before and after the Dreamstride. Exiting before the dreamstride will enable you to do it again after the dream, or else you will not be able to exit the temple at all. After drinking the Torpor, or shortly after pulling the chain to release the miasma, the game may crash. You can bypass the dream sequence entirely using the console commands player.setstage da16 160 and movetoqt da16 2. Sometimes Erandur will not lead you to the temple, and will stand in place at the inn. Using Unrelenting Force on him may cause him to act normally and start walking. Simply sprinting and bumping into him will sometimes make him move as well, especially if he is stuck next to the bar. Leaving the inn and re-entering may fix the issue. Use the command prid 24280, followed by moveto player when just outside the temple to move him directly to the entrance of the temple. Similarly, Erandur may go up to the door to Nightcaller Temple, or the library door within it, and just stop. ? Saving then reloading this save should joggle him to continue. Failing that, revert to an earlier save, and if any combat happened before the door in question, use Wait for an hour immediately after the combat, before he goes to the door. If you enter Nightcaller Temple before Erandur, he may be immediately transported further in without opening the entrance, making the quest impossible to finish. To avoid this, make sure you let Erandur enter the temple before you. It is possible to use the clipping glitch to progress past the initial door. Use the object on the right hand wall if you've just entered the keep, fall down to the room off to the side, and run forward to catch up to Erandur. After completing quest you can use buckets in the temple for easy clipping. Once you are in the library and have killed the Orcs and Vaermina's followers there, Erandur may simply stand around on the lower level without telling you what to do next. It may require talking to him two or more times to get the next instruction to search on the upper level. Once you have removed the soul gem to take down the barrier, the barrier may not come down. This leaves you unable to talk with Erandur. ? To bypass this, proceed to the last room with the skull on your own. Erandur should be waiting for you there. Make sure you speak with him straight away. If not, he will simply go back behind the barrier. If he isn't waiting for you, then load an earlier gamesave from when you were at the inn. He is bound to show up there. In case you're completely stuck and none of the above helps, go back into the temple, open the console and type these commands: prid 24280 and moveto player. After you have killed Veren and Thorek and are at the point when you have to speak to Erandur, no interaction with him may be possible, including talking. If this happens, run all the way back to the front door of the temple. Go outside and then come back in. During the Dreamwalker flashback, you may be unable to pull the chain to release the miasma. A possible fix is to avoid drinking the torpor and use the console command TCL to run to the chain outside of the flashback; while there, you should take the soul gem used to form the miasma. This will skip the entire flashback. Running to the central room with the skull, you will find Erandur and the quest will proceed normally. In addition to attacking Erandur, Veren and Thorek may also attack each other, making this fight particularly easy. In some cases, it may happen that Orcish Invaders and Vaermina Devotees that were defeated before drinking Vaermina's Torpor get replaced with naked bodies, while still having default items in their inventory. Occasionally, they may have standing animations, but horizontally and with their eyes closed, after the dream sequence. In addition, the Vaermina Devotees' inventories are refilled; if they were looted already, this allows you to gain twice as many items from them. The defeated Orc Invaders are not affected by this inventory resetting. ? To fix the animation once the quest is finished, simply save the game after leaving the area and reload it; this should replace the bugged corpses with normal ones (though still naked). If the Dreamwalk sequence did not start for you, you might find that it starts inappropriately at a much later stage in the quest, e.g. when you are supposed to help Erandur fight Veren and Thorek. ? The workaround is to do the Dreamwalk sequence if you like (though you'll likely remain stuck in it even after triggering the Miasma), then open the Console and enter SetStage commands, one after another, for every quest stage up to the point where you are supposed to be in the quest; then do CoC NightCallerTemple01, and go back to where you left Erandur (who may be fighting Veren and Thorek on his own, though there is no need to hurry, as he is Essential and thus unkillable until the ending sequence of the quest). 200 Finishes quest I've made my decision, and allowed Erandur to live. The Skull of Corruption has been destroyed and Erandur has offered his services as a companion if I should ever need his assistance. Finishes quest I've made my decision and Erandur has died by my hands. Unfortunately, the Skull of Corruption was destroyed before I could take his life. Such moments are the misfortunes of the indecisive. Finishes quest I've made my decision and Erandur has died by my hands. I now possess the Skull of Corruption and look forward to performing my duties for Lady Vaermina. The following empty quest stages were omitted from the table: 0, 5, 10, 22, 40, 145, 148, 155, 190, 196. On the PC, it is possible to use the console to advance through the quest by entering setstage DA16 stage, where stage is the number of the stage you wish to complete. It is not possible to un-complete (i.e. go back) quest stages, but it is possible to clear all stages of the quest using resetquest DA16. This page was last modified on 19 December 2018, at 19:56.